The Great Western Railway (GWR) was a British railway company and was founded in 1833 with the aim to connect Bristol with London. In 1838 the first trains started to run and soon the company developed to a web of railways that linked London with the Midlands, the South-West and West of England and most parts of Wales. In 1947 the company was nationalised and became the Western Region of British Railways. The GWR was called by some "God's Wonderful Railway" and by others the "Great Way Round" but it was famed as the "Holiday Line", taking many people to English and Bristol Channel resorts in the West Country as well as the far south-west of England such as Torquay in Devon and Minehead in Somerset and Newquay and St Ives in Cornwall (Wikipedia). 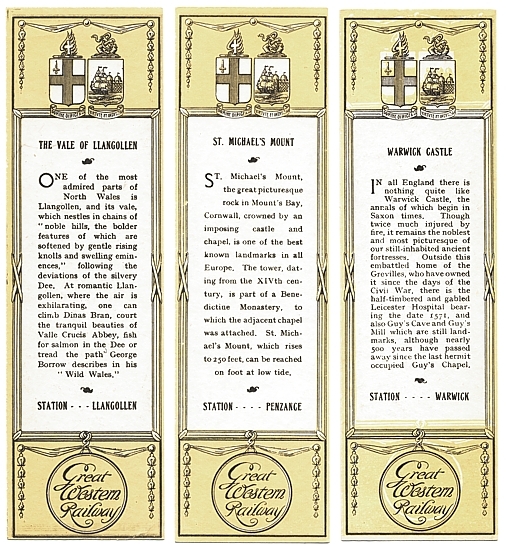 Like many railway & shipping companies all over the world, also the GWR made use of bookmarks for advertising purposes. 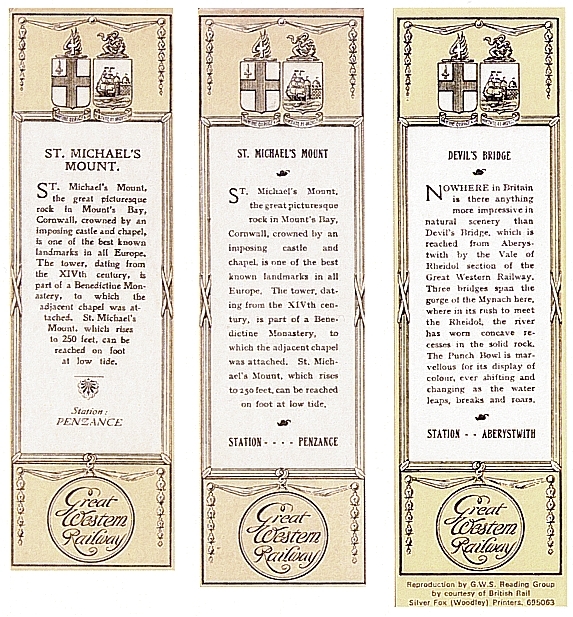 The earliest documented GWR bookmarks date from 1905 and they make publication in colour illustrations for the destinations Cornish Riviera and Fair Devon (Bunting, p. 2). From 1923-1929 the GWR published a guide book with the title Holiday Haunts covering its holiday destinations. 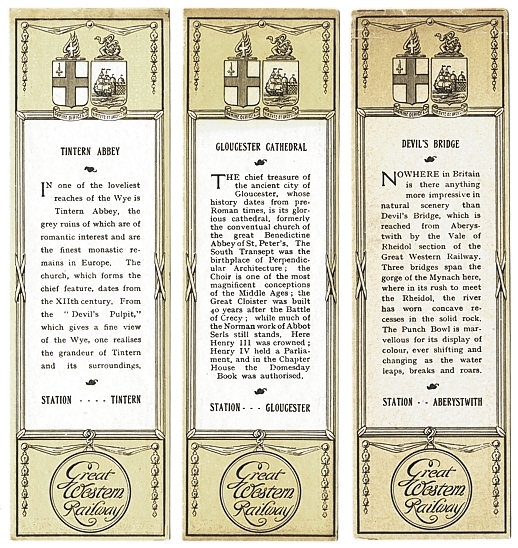 To accompany and promote this book came a series of six bookmarks each illustrating one of the Haunts, with background information and the name of its nearest railway station on the reverse. 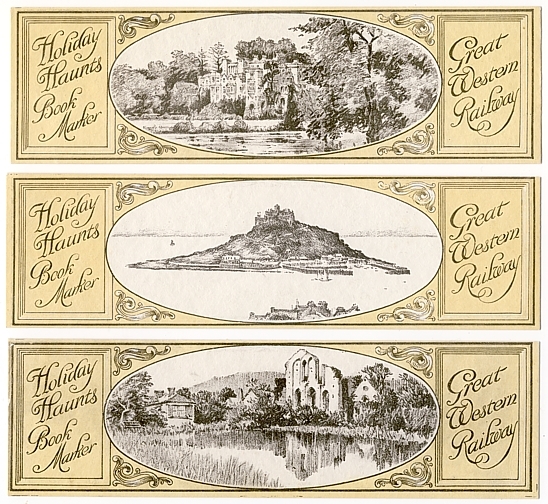 Three of these Holiday Haunts bookmarks have illustrations in portrait format (see Figure 1), the other three in landscape format (see Figure 2). In one of the loveliest reaches of the Wye is Tintern Abbey, the grey ruins of which are of romantic interest and are the finest monastic remains in Europe. The church, which forms the chief feature, dates from the XIIth century. From the "Devil's Pulpit", which gives a fine view of the Wye, one realises the grandeur of Tintern and its surroundings. The chief treasure of the ancient city of Gloucester, whose history dates from pre-Roman times, is its glorious cathedral, formerly the conventual church of the great Benedictine Abbey of St. Peter's. The South Transept was the birthplace of Perpendicular Architecture; the Choir is one of the most magnificent conceptions of the Middle Ages; the Great Cloister was built 40 years after the Battle of Crecy; while much of the Norman work of Abbot Serls still stands. Here Henry III was crowned; Henry IV held a Parliament, and the Chapter House the Domesday Book was authorised. Nowhere in Britain is there anything more impressive in natural scenery than Devil's Bridge, which is reached from Aberystwith by the Vale of Rheidol section of the Great Western Railway. Three bridges span the gorge of the Mynach here, where in its rush to meet the Rheidol, the river has worn concave recesses in the solid rock. The Punch Bowl is marvellous for its display of colour, ever shifting and changing as the water leaps, breaks and roars. In all England there is nothing quite like Warwick Castle, the annals of which begin in Saxon times. Though twice much injured by fire, it remains the noblest and most picturesque of our still-inhabited ancient fortresses. Outside this embattled home of the Grevilles, who have owned it since the days of the Civil War, there is the half-timbered and gabled Leicester Hospital bearing the date 1571, and also Guy's Cave and Guy's Mill which are still landmarks, although nearly 500 years have passed away since the last hermit occupied Guy's Chapel. St. Michael's Mount, the great picturesque rock in Mount's Bay, Cornwall, crowned by an imposing castle and chapel, is one of the best known landmarks in all Europe. The tower, dating from the XIVth century, is part of a Benedictine Monastery, to which the adjacent chapel was attached. St. Michael's Mount which rises to 250 feet, can be reached on foot at low tide. One of the most admired parts of North Wales is Llangollen, and its vale, which nestles in chains of "noble hills, the bolder features of which are softened by gentle rising knolls and swelling eminences", following the deviations of the silvery Dee. At romantic Llangollen, where the air is exhilarating, one can climb Dinas Bran, court the tranquil beauties of Valle Crucis Abbey, fish for salmon in the Dee or tread the path George Borrow describes in his "Wild Wales". 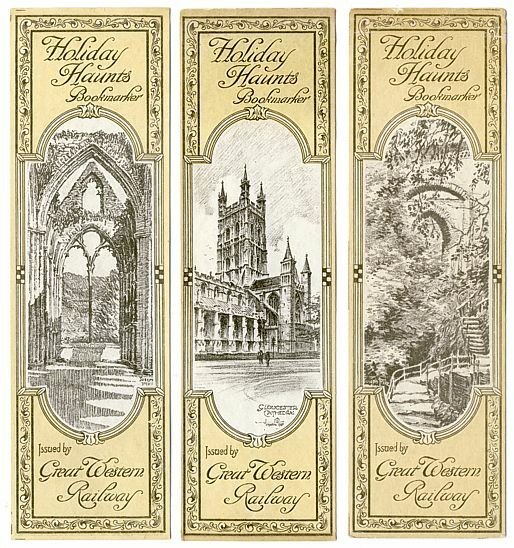 ​Part way through, GWR reissued their publication Holiday Haunts with the same content, but in a larger format. This probably explains the fact that the bookmarks come in sets of larger (18 x 5.5 cm - Figure 1 and 2) and smaller bookmarks (17 x 5 cm), identical apart from the size. The larger ones are some of the commonest railway bookmarks found today, but the smaller are much more difficult to find. ​If looking at a scan that does not give the size, the only way to tell whether it is a large or small bookmark is by the reverse. Figure 3a shows how the smaller bookmark has the word Station printed above the place name, whereas on the larger bookmark it appears alongside (Figure 3b).